Keywords play a huge role in website SEO. Your website’s intended visitors would most likely find your website after they’ve typed certain keywords in Google Search. But for your website to be found easily, you’ll have to know first what niche you want to specialize in, who your website’s intended audience is, and what common keywords they use to find content that caters to their needs. Avoid using keywords that have very little or nothing to do at all with your website’s intended visitors when crafting content for it. If you want your website to be on top, putting your chosen keyword in its published content only once isn’t the way to go. Instead, you’ll have to mention the same keyword more than once. The more instances that a certain keyword is used in your published content, the greater its chances of appearing in Google’s first page of search results – although this isn’t always the case. Google has become incredibly smart throughout the years that it can often detect if a website’s contents are overstuffed with the same keyword, and it penalizes websites that commit this SEO mistake. So when crafting content for your website, make sure not to underuse or overuse your chosen keyword. People value original content as this shows how the person who wrote it spent a good amount of time coming up with something that isn’t like the rest. If you’re too lazy to write original content for your website and would rather copy and paste choice selections from other websites, your intended audience will know eventually and cross you out from their list of websites to visit. If you really care about your website’s potential visitors, tackle a subject matter in your own words and in a way that hasn’t been done by anybody else before. A lot of people use their mobile devices nowadays to access the Internet. No need to wait until one can sit down in front of a desktop or laptop just to connect to the web. You might be thinking that your website is already good as it is since you tried to access it using both your desktop and your smartphone, and it loads just fine. Unfortunately, not optimizing your website for mobile can bother some of its visitors, especially after they find out that your content is unreadable due to its small font size amongst other presentation and layout problems. You’ll thus want to include a few lines of code in your website allowing for responsive web design so that it can easily adjust no matter how small or big a mobile device’s screen is. Most people spend a great portion of their time on the web checking their social media accounts and sharing anything they find interesting there for their online friends to check out. When building a website, make sure that it has social media integration so that its intended visitors can easily share any of its published content in one go instead of having to copy and paste the URL in their social media account’s status update box. It might surprise you to learn that website SEO isn’t completely set in stone. An SEO practice that worked back then might not be working anymore, especially in today’s ever-changing Internet landscape. However, it doesn’t mean that you shouldn’t optimize your website for Google’s first page of search results as SEO optimization is still just as important now as it was back then. 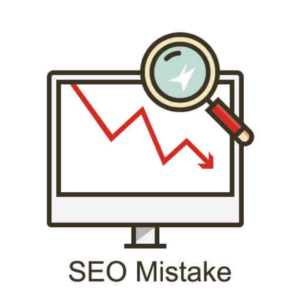 You’ll want to watch out for the above-listed SEO mistakes when making your own website so that your chances of landing a coveted spot in Google’s first page of search results would get higher than if you aren’t doing SEO at all.